Home → Uncategorized → If you formed a Channel Partner Advisory Council, which Partners would you want to participate? The road to Hell is paved with good intentions. That’s my subtle warning about Advisory Councils. Advisory Councils are worth the effort, believe me. Properly managed, they provide insight you couldn’t duplicate in 100 focus groups. And while it’s true that in some industries Advisory Councils can be a bit of a boondoggle, the majority are all business. 1. Why do we need a CP Advisory Council? Good or bad, politics is reality. Just be clear about what’s behind the curtain and plan accordingly. In fact, if you’re savvy, you should be able to take advantage of it. 2. What’s the purpose of your CP Advisory Council? Gain much-needed market insight or feedback to existing and planned Channel programs. Help us make better decisions. A sounding board for testing new ideas, plans. Improve communications with our entire Partner Channel and use the Advisory Council as a two-way conduit. Objective guidance on our business, practices, products, people, goals. What you want to figure out is this: How can we make certain our Advisory Council pushes us to be at our very best. Do that and you’re off to a superb first step. Don’t miss that last bullet. If these people aren’t fun to be around, you’ve just hooked your ladder to two years of torture—like sitting in a classroom for 32 hours of squeaking chalk. Besides achieving a cross-section of participants, one NON-NEGOTIABLE is that council members must be empowered to make decisions for their organizations. The last thing you want is to hold a meeting, get buy-in (with everyone standing in their chairs cheering! )—only to have the whole thing shot-down a week later when the members go back to their companies and aren’t able to persuade the real decision-maker to hop aboard. This is where the proverbial rubber meets the road: the details. Attend at least ____ meetings per year (length, location or virtual). Be available for ____ telephone calls each year from your staff seeking advice of the Partner. Term (most council memberships have an initial two-year term). What specifically are you counting on them to contribute (expertise, thinking, ideation, etc.)? Who in your organization is going to drive this? If you’re the top-dog, you can’t be the point-man. What does the Channel Partner get? (also see related article: The intangibles and the tangibles). Those are the highlights from my personal experience. Think of them as things you should do all on your own in the quiet and comfort of your office before deciding if you’re ready to form your own Partner Channel Advisory Council. The next step is to get professional advice, even if it’s limited to reading white papers on the subject. 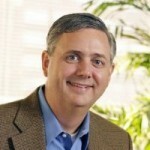 A terrific resource for you is Sean Geehan, founder and CEO of Geehan Group. The advantage of working with an Advisory Council expert should be obvious—unless you want to enjoy the trauma/drama of figuring it out on your own. 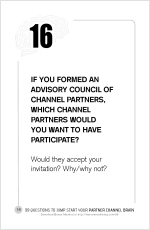 Inviting customers onto your Partner Channel Advisory Council. While it’s tempting to do this, your Partners won’t be able to get out of selling-mode. (a really great point!). If you want C-level execs, keep your recruiting to that. Partner presidents and marcom directors, for instance, are an uneven balance. Plan for listening 80% of the time. This means you have to provide materials to your members in advance so they have time to prepare. Aim for more member dialog vs. your monologue. While you don’t have to execute on everything you discuss, you must provide a timely, post-meeting summary with your prioritized follow-up action plan.